It has been a little while since I last posted on this blog; apologies for this but sometimes life gets in the way of blogging! Anyway, I thought that those who are interested in the business side of photography might be interested in something that came into my thinking on a long drive back from a job listening to a business programme on BBC radio. When I got home I produced a couple of reports from my invoices using the wonderful Billings Pro application on my Mac. The one that caught my eye was one that gave me the raw data to work out how the bulk of my work (based on turnover) in the last six years as a freelance has come in. Conventional wisdom says that a photographer gets out there with their folio after making cold calls and arranging appointments with potential clients. When I say ‘conventional wisdom’ I mean ‘what they taught me in college’. It is the classic sales tactic: research potential customers, show them what you have to offer and then (hopefully) close the deal at a mutually acceptable price. 99% of photographers and probably 88% or all businesses will probably tell you that it is neither that simple or that straightforward. The monetary value for each client is based on that initial method of contact. Some high value clients have been very loyal to me and I hope that I have, in turn, given them the photographs that they need to keep those excellent two-way relationships going. On the flip side, most of the work that has come via the web has been one-off jobs for clients who don’t have a lot of work to commission. Now I don’t know about you, but I found that to be quite a shocking set of results. Only 5% of my income has been generated by getting out there and trying to make sales in what you would call a ‘traditional’ way yet more than twice that figure came from referrals from other photographers. The sub-contract figure at 27% is also a lot higher than I thought that it would be but the biggest surprise is how low the figure for income generated via work from pre-freelancing colleagues. In my first year as a freelance that figure was considerably higher but it has been eclipsed by the friends and family percentage which, at 44%, is somewhat higher than I would have thought. People finding me through the web includes not only those who have found my website through searches but also the various social media platforms that we all spend so much time working on – 4% isn’t a great return on all of that effort either. If I had the time, I’d like to work out how different the chart would be if I based the figures on the amount of time spent on the jobs rather than the money invoiced. My strong suspicion is that the cold calling and portfolio section would be a fair bit bigger as would the one for pre-freelancing colleagues because those are both news and editorial biased sections whereas the friends and family one is far more corporate and commercial. So what conclusion should I draw from this? Maybe I should spend less time trying to generate work from cold-calling and spend a lot more time with family and friends? I suspect that the true answer is that I need to change my targets for the cold calling to more corporate and commercial ones simply because they have a higher value per job. Wearing out shoe leather and social media is the mantra I hear all the time. And whilst meaningful it just goes to show that there are better ways to invest your time. Have you employed an agent, ever? 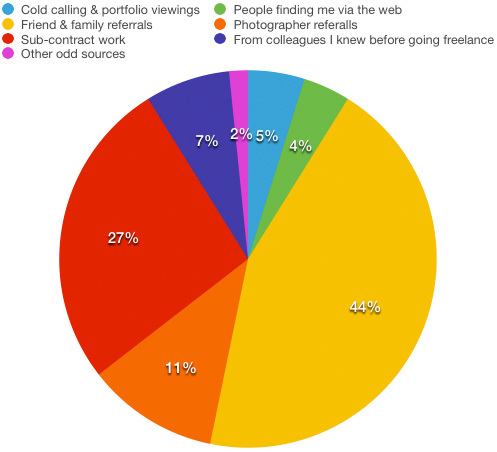 How much time do you put into cold calling and what form does it take and what do you use as your presentation ‘kit’? Does it include a brochure, a letter… ? I would like an agent but I haven’t found one that would suit what I want/need. I spend a couple of hours a week trying to drum up business on the phone (sometimes less, sometimes more) – mostly to people I have never contacted before. I have a PDF folio that I can mail to them, they can go to my website and I always try to arrange a meeting where I can get my printed folio out (or the iPad). No brochure but I have produced limited edition 6×4 photo books and mailed them out with zero success. I’m trying to learn this stuff and the wisdom I am receiving is that the letter is the key. I can recommend some books and a couple of websites if you are interested. I can’t say from personal experience that it works, but direct response marketing has the advantage of being testable. Now that is interesting – thanks for sharing Neil. I wonder if it’s related to your specific type of photography/market? I think that there are many reasons: my age, my background, my geographical location and probably my dislike of actively marketing myself. Who knows for sure though? That’s really interesting and very closely matches my own gut feel conclusions and experience. There’s only one significant difference: I’ve lost the approx 25% subcontract work in recent years as the designers who used to generate commissions have been forced to use generic stock and client staff generated photos, by strangled budgets. Otherwise network connections – recommendations by clients, friends etc were basically what gave me a 30 year career. Cold calling/ folio hawking a total waste of time, and only rare work from drive-by web viewers. As for unsolicited mail, as one commenter suggests, just don’t. Commissioners are inundated by hundreds of photographers marketing and hate spam as much as the rest of us. The best thing is as it always was: establish a niche, do it better than competitors and your name will get passed around and the work will find you.